The Dung Gate is one of the nine gates to the Old City in Jerusalem. It gains its name from the fact that it was the gate used to take trash out of the city to be disposed of in the Kidron Valley. It is seen here as heavily populated with pedestrians and vehicles, due to the fact that it serves as the main pathway to get to the Western Wall. 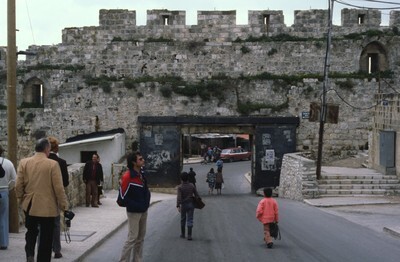 Smolski, Chet, "Jerusalem: Dung Gate" (1980). Smolski Images. 728.